Spacious 2 storey chalet, 1 of 50 located in a little hamlet just outside Stadl an der mur. The chalet sleeps 4-8, with 2 bedrooms and bathrooms, TV, WiFi, living and dining areas, kitchen, conservatory, upstairs balcony and terraces. The chalet is heated with a gas fire and underfloor heating, there is a family sized sauna and the all important boot warmer. We have a jacuzzi bath in the main bathroom.There are local shops, many restaurants and bars just a short drive away. With pistes at up to 2200m, the region boasts some of Austria's most snow-sure skiing. From the largest half-pipe in Europe to a 1200m long toboggan run there is something for the whole family. As a dual-season resort, there is a stunning 18 hole golf course, horse riding, hiking, fishing, swimming and mountain biking nearby. The area is stunning in the summer with temperatures well into the 80's. Please note there is a cleaning and laundry fee as well as the Austrian Tourist Tax to pay locally. Cleaning and laundry is currently €80 plus €5 per person. The tourist tax is €1 per night per adult. Please complete the book during your stay. The main bathroom upstairs is fitted with toilet, basin and a Jacuzzi bath, great for relaxing after a day on the pistes. The second bathroom is downstairs and is fitted with a toilet and basin and a shower off the sauna area. In the lounge area there is a satellite television with DVD player. The sofa folds down and becomes a sofabed. The dining area has a table and chairs, enough seating for 8 people. The floor has underfloor heating in this area. Kitchen area is fitted with everything you would need for a self catering stay. There is a cooker, fridge with freezer compartment, kettle, toaster and all the crockery and utensils for 8 people. This area also has a washing machine and dryer installed. The Kreischberg ski resort is only 10 minutes by car. There are 35km of ski slopes for the whole family from mid December till early April up to 2200m high. It houses Europe's largest half pipe!for the snowboarders and has many fun activities for children. The Turracher Höhe resort is about 20 minutes away by car and as well as many pistes there is a frozen lake to travel across. With 38 km of slopes catering to all abilities at 1400 - 2205m from November to May. A little further away, about 45 minutes by car is Obertauern – one of the snowiest ski resorts in the Alps. 1,740 m to 2,526m, skiing on 100km of Pistes. The nearest golf course is less than 10 minutes away by car at "Murau-Kreischberg", a stunning 18-hole golf course in the Mur valley at the foot of the Kreischberg mountain. Notes on accommodation: The chalet is fitted with a family sauna and underfloor heating throughout. For larger groups, or more than 1 family, we have access to other chalets on the complex, please email me for availability and prices. Outside: Outside the chalet at the front of the property is a large decking area with furniture to sit and enjoy the view down the Mur valley. At the rear of the chalet is another decking area to catch the sun and there is also a upstairs balcony area off the main bedroom, again with furniture provided. To the side of the chalet is a parking area and outside lights. Cleaning / Towels / Linen / Maid service: All towels, linen and sauna robes are provided for your stay. 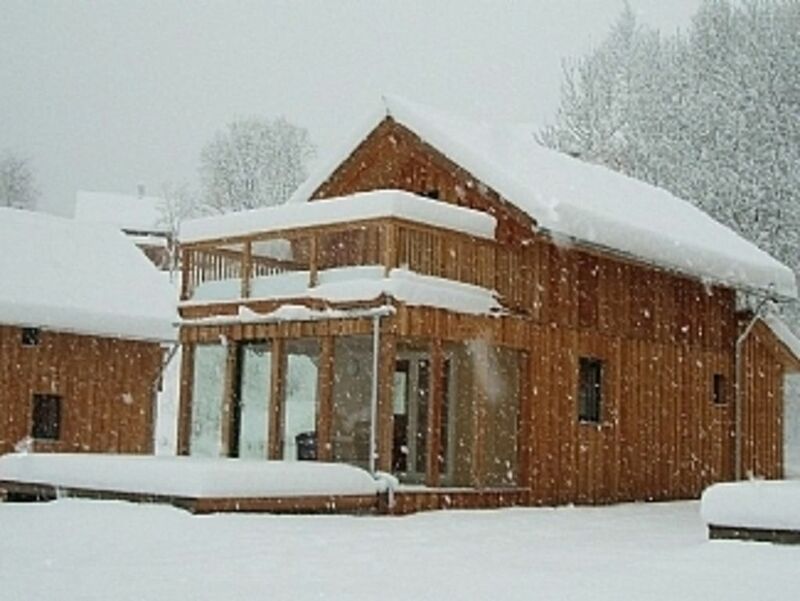 The chalet will be clean on your arrival and then cleaned weekly. There is a cleaning charge which you pay locally on your day of departure. Other: The chalet has a conservatory, which can also double as a 3rd bedroom as it also has a sofabed. We have also provided for your use a Ipod/mp3 player, you just need to bring your Ipod/mp3 and lead. We have provided a cot and high chair for younger guests. Prima Urlaub in einem top Haus! Whether you are travelling from Salzburg airport or from Klagenfurt or Vienna, if you visit our web site below we have the directions written out for you. The drive from either Salzburg or Klangenfurt takes about 90 minutes. A car is essential for your stay, all ski resorts have free carparking on site. This small hamlet is a short walking distance outside Stadl an der Mur which has several shops and a bank and post office, as well as a hotel and a few bars/cafes. Stadl-an-der-Mur lies at the bottom of the Kreischberg mountain, in the valley next to the River Mur. It is in the province of Styria (known locally as Steiermark), on the border with Salzburgerland, approximately 90 minutes south of Salzburg. Booking Notes: You can either book on this site or go to our web site www.blueskylettings.com and from the Austria page open the link "availability and prices" and select the dates you require and how many people and the total will be shown. Follow this on to book your stay. It is worth mentioning the calendar is "live" therefore it can be booked by anyone at anytime. Changeover Day: We are totally flexible with our changeover days. Notes on prices: Now with special deals and discounted rates on certain dates just ask! !